Image courtesy of Rick Turoczy. 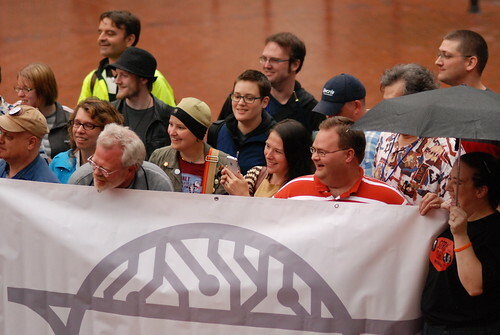 Open Source Bridge is 100% volunteer run event and we can’t have a successfull event without you! One of the most direct ways you can make OSBridge a fantastic event is to volunteer on-site, during the conference. We have many volunteer positions available, from dead simple errand-running, to the more complicated registration, speaker lounge, and volunteer coordinator positions. We have something for everyone, and you don’t have to be an uber coder to be a stellar volunteer. Because we <3 our volunteers, and as we did last year, we’ll be providing a complimentary ticket to those volunteers who commit at least 8 hours of their time at the conference. If you can’t come to any of the meet and greets, or have questions before then, please contact our volunteer coordinator, Christie Koehler at volunteer@opensourcebridge.org. This entry was written by christie, posted on May 5, 2010 at 3:04 pm, filed under announcement, citizenship, Volunteering and tagged Volunteering, volunteers. Bookmark the permalink. Follow any comments here with the RSS feed for this post. Both comments and trackbacks are currently closed. « Your favorite presentation tool – tell us! Thanks for making such a range of meet & greets available, and with such advance notice!